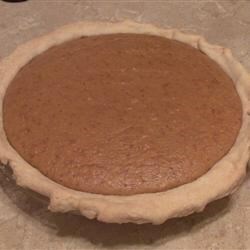 "Here is a fun recipe for those brave enough to make this wonderful pie from a pumpkin." Cut out top of pumpkin and clean out all seeds and strings from inside. Slice pumpkin vertically into 3 inch wide strips. Place strips onto a baking sheet. Bake in preheated oven for about 1 hour. Once done, scrape the pumpkin from the skins, then beat with a mixer or puree in a food processor until smooth. Mix the nutmeg, ginger, salt, evaporated milk and eggs with the pumpkin puree. Pour mixture into two 9 inch pie crusts. Bake in preheated oven for 15 minutes. Reduce oven temperature to 350 degrees F (175 degrees C) and bake for an additional 35 to 40 minutes, or until toothpick inserted into center comes out clean. Cool and refrigerate. THis recipie was absolutley horrible. I didnt realise there wasnt any sugar until after it was in the oven, so I spent an hour just wondering if it was going to tast bad. And it did. Yuck!!!! i followed it step by step, my kids were so upset they waited so long to eat it and it wasn't good.